Explanation: This bright white swath cutting across the surface of icy Jovian moon Europa is known as Agenor Linea. In all about 1000 kilometers long and 5 kilometers wide, only a section is pictured here as part of a combined color and black and white image based on data from the Galileo spacecraft. Most linear features on Europa are dark in color but Agenor Linea is uniquely bright for unknown reasons. Also unknown is the origin of the reddish material along the sides. 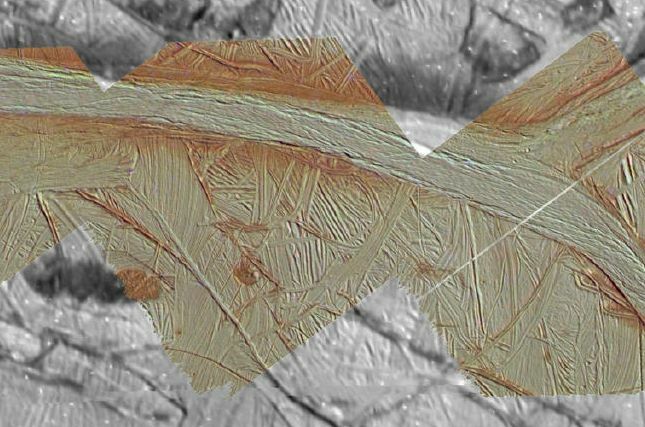 While these and other details of Europa's surface formations remain mysterious, the general results of Galileo's exploration of Europa have supported the idea that an ocean of liquid water lies beneath the cracked and frozen crust. An extraterrestrial liquid ocean holds out the tantalizing possibility of life.